Hey Scotchit, long-time lurker, first-time review (discounting the Bunnahabhain 12 community review a couple weeks ago). For my first review, I thought it’d be interesting to take a look at something procured through a swap over at ScotchSwap. This particular sample comes courtesy of TheDopeGodfather, who was kind enough to send his samples out in advance of me receiving my bottles. What a stand-up guy. Anyway, on to the review! 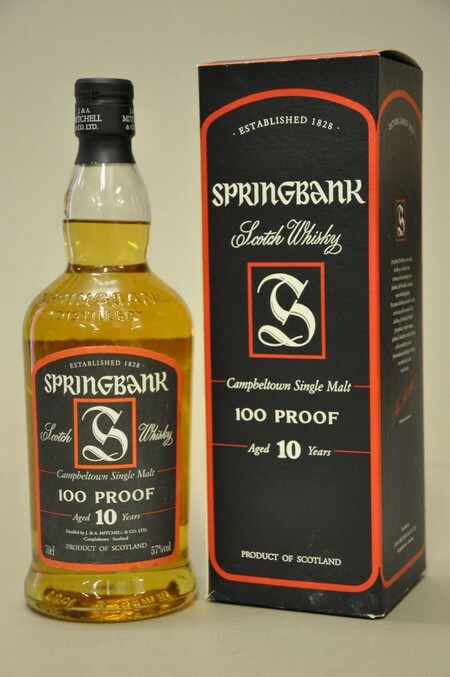 There are apparently two different “100 proof” versions of the Springbank 10 year old. This one, the U.S. version, is bottled at 50% ABV and has spent some time in ex-sherry casks. There’s another UK version that is bottled at 57% that is supposedly quite different in character from the one I sampled here. Hopefully someday I’ll be able to compare the two. Raspberries; Turbinado sugar; Fresh-baked bread; Mountain laurel; Dates; Anjou pear; Pork fat; Light smoke; Manuka honey; Sea salt; Butterscotch. First let me say that at 100 proof, this whisky benefits from sitting in the glass before nosing/tasting. I let my sample sit for about 15 minutes after my first nosing, and it was amazing how much it opened up in that time. The first thing that hits you is the raspberries. I don’t know if I’ve ever smelled a whisky that had such a distinct and immediately discernible smell of this particular berry. From there, the sweet and the savory almost take turns presenting themselves, making for a very memorable and well-rounded nose. And there isn’t a bad note in there. Medium-bodied; Oily; Light burn (surprisingly smooth for 100 proof). Orange zest; Mulled cider; Black tea; Nutmeg; Ginger; Dark chocolate (65%+ cacao). The taste on this one is less dynamic than the nose, which ends up keeping it from scoring even higher. Although there aren’t any off notes, what’s there isn’t nearly as interesting to me as the sweet/savory combo that was going on in the nose. In other words, although this is extremely tasty whisky, I feel like it almost set the bar too high in the nose, and when it wasn’t able to deliver fully, I was a little disappointed. Medium-long. The finish, while by no means exceptionally long, was commendable in that several notes in the taste evolved throughout its duration. 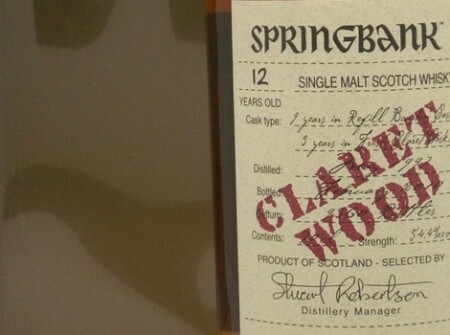 Overall: This whisky is truly one worth trying. The nose on it surpasses pretty much anything I’ve had to this point (admittedly, < 50 whiskies to date), and although the taste disappointed me a little, it wasn't because it was bad — as a matter of fact, it was above-average. I feel that it's because the nose set such a high bar that it left the taste feeling a little "average" by comparison. All in all, a worthy whisky, and being the first one I've tried from Campbeltown, it's definitely gotten my interest piqued and I'm looking forward to further exploring that region.